In January 2005, my husband and I had the pleasure of going to Ireland with our neighbors. We spent the majority of our time in the pleasant little seaport of Dingle. Dingle has a population of 1,500 and a mere 52 pubs. Throughout our visit, we began to notice that these pubs were not only abundant in number but were multipurpose—pub and haberdashery, pub and hardware, pub and bike rental, etc. Marc “Seamus” Leffler and his wife, Cookie, were inspired to build their own backyard pub from visiting Ireland’s pubs like this one in Dingle. Quickly into the trip, we began joking about converting our attic back home in Jackson, MS, into a pub. And when my husband was given the nickname Seamus, the jokes became a little more serious. At the time of our (sad) departure from Ireland and because we didn’t want the fun to end, the conversation of building a home pub moved from our attic to the storage room at the back of our house that opens to our backyard—pub and storage room, multipurpose, remember? As soon as we were back home, my husband and neighbor, Dan Autrey, got to work. The goal: Open by St. Patrick’s Day. Any great pub deserves a great logo. Marc, vice president and creative director for Maris, West & Baker Advertising, made sure O’Leffler’s had just that! Seamus O’Leffler’s, as it was aptly named, was really happening! By St. Patrick’s Day we had our little pub, painted white with touches of Kelly green, well-constructed wooden benches with handmade cushions, a sturdy, handsome bar, and lots of Irish paraphernalia. Our parish priest, Father Mike O’Brien from Ireland, blessed Seamus O’Leffler’s Pub (and storage room) for fellowship, and the six of us present that first night had fun listening to Irish music and having some craic (a laugh). On the first anniversary of Seamus O’Leffler’s, Father Mike joined us again. To his surprise, his blessing had reached fruition, as 150 friends were there for some more craic! The pub was, and is truly, a gathering place. Sometimes big gatherings. Sometimes small. 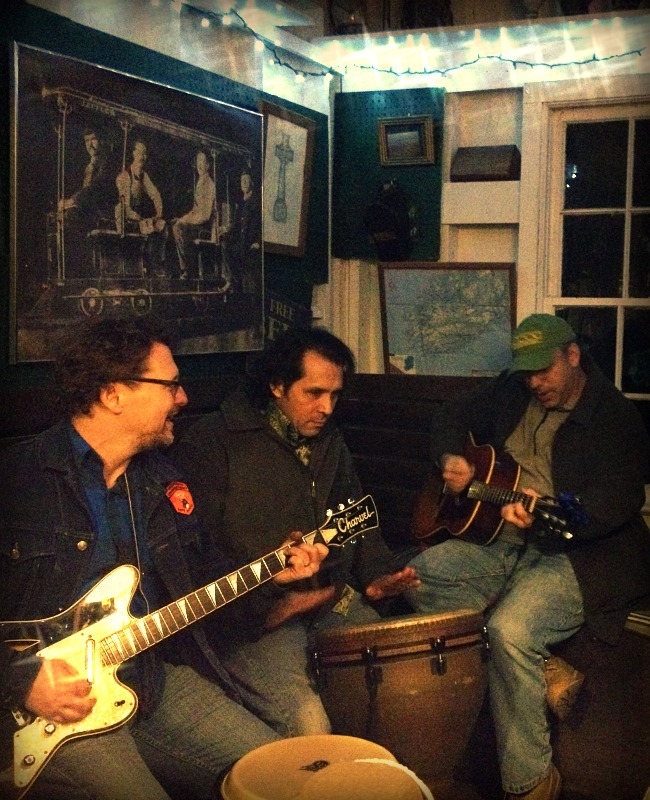 Marc, Kevin Weimer, and Greg Caraway keep O’Leffler’s grooving’ with some live tunes. After Hurricane Katrina, we all gathered in the heat just to be together. After a dear friend died too young, we found solace in gathering at the pub. For birthdays, holidays, beautiful days, if the “pub open” light is on, neighbors know to come on in. They can even turn the light on themselves—to this day our neighbors often gather without us. The pub is undoubtedly a special place. It doesn’t seem like much when closed and the lawn mower rests center stage, but when the lights are on and Irish tunes are playing, Seamus O’Leffler’s comes alive. Over the years, O’Leffer’s has taught me a valuable lesson: The people at each gathering are the people meant to be there; they are a gift. I used to find myself disappointed if certain invited guests didn’t show up because I’m shy and get a little nervous when I am around people I don’t know. However, I’ve now realized that, when friends I know well aren’t able to come, I’m given the opportunity to get to know strangers and, in many cases, make new friends. Coming out of my shell is still uncomfortable, but I’m glad each and every time I do. This life lesson has translated into everything that I do, and I’m all the better for it. Who knew my storage room held some of life’s lessons?